Star Trek Into Darkness is hitting theatres on May 17, so it’s time for Classics Corner to take a look back at the first attempt at modern Star Trek figures. 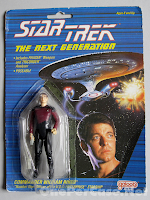 In the late 80s, Star Trek: the Next Generation was rising to its spot as the undisputed champ of sci-fi syndication. 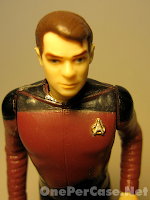 Galoob hopped on the growing cash cow and put out a line of figures and die-cast ships. For some reason, it didn’t pan out well. 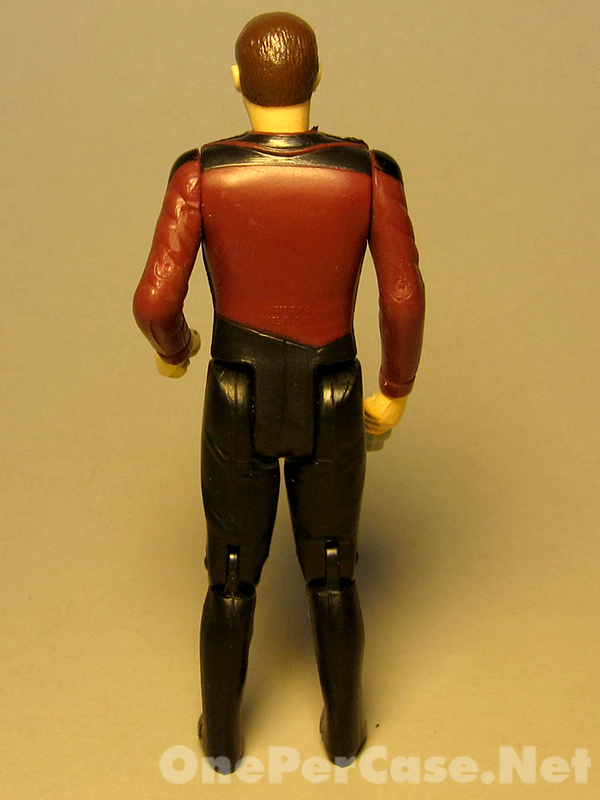 Commander William Riker was one of a handful of figures from a short lived line. If you’ve never seen Star Trek: the Next Generation, first, don’t talk to me, and second, go watch it. Like most shows, it starts out a little slow, but when it gets good it gets great. 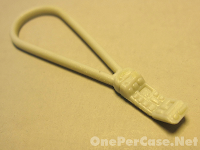 Galoob was, and still is, best known for Micro Machines. 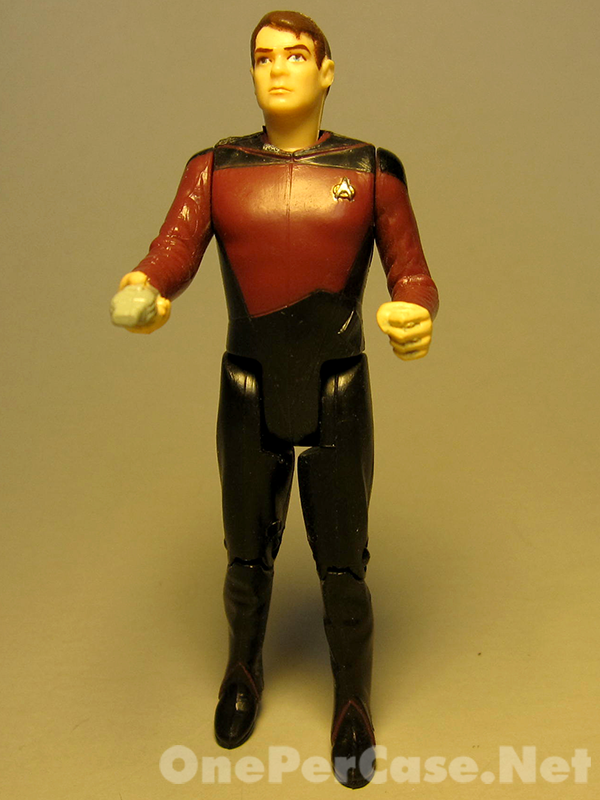 Looking at this Riker, it’s lucky for Galoob that Micro Machines was a hit. Pay attention to the packaging – it’s the highlight of the review. 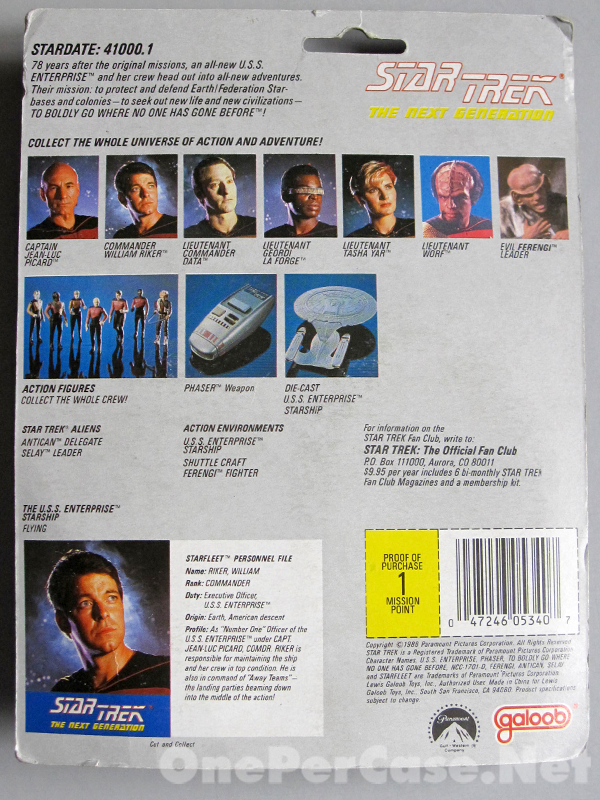 The front features the real logo and a quality image of the Enterprise flying into action over Riker himself. In a way, it’s almost like a better done version of the 90s Star Wars Power of the Force 2 collection. 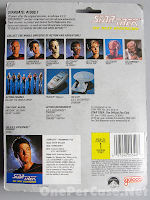 The back of the card gives you a quick blurb about ST:TNG, images of the other characters and toys you can find on the toy shelves, and a short data file type description of Riker. And of course, there’s a UPC code with a dead end “Mission Point” proof of purchase. Sadly, now it’s time to move on to the figure itself. Thanks to the packaging, the uniform color and the rank pips, you can determine that this is indeed a Wil Riker figure. 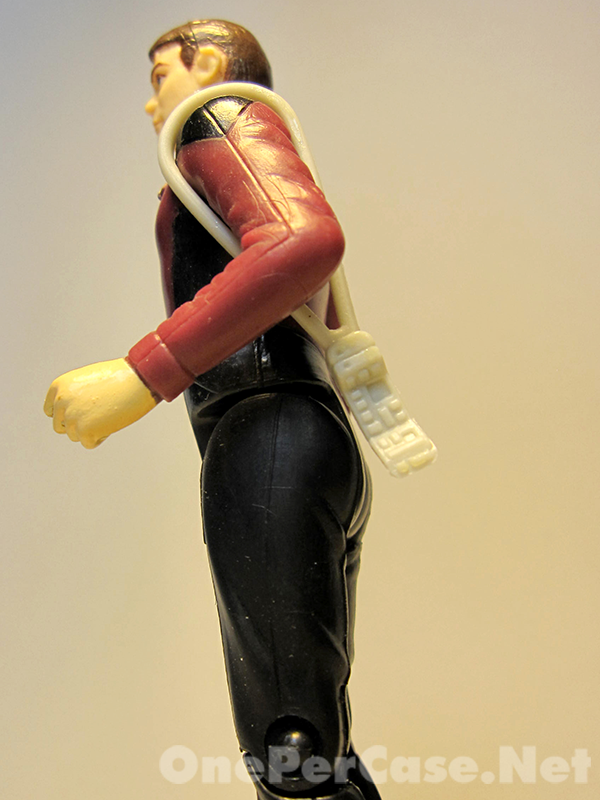 You’d be hard pressed to figure it out from the sculpt. 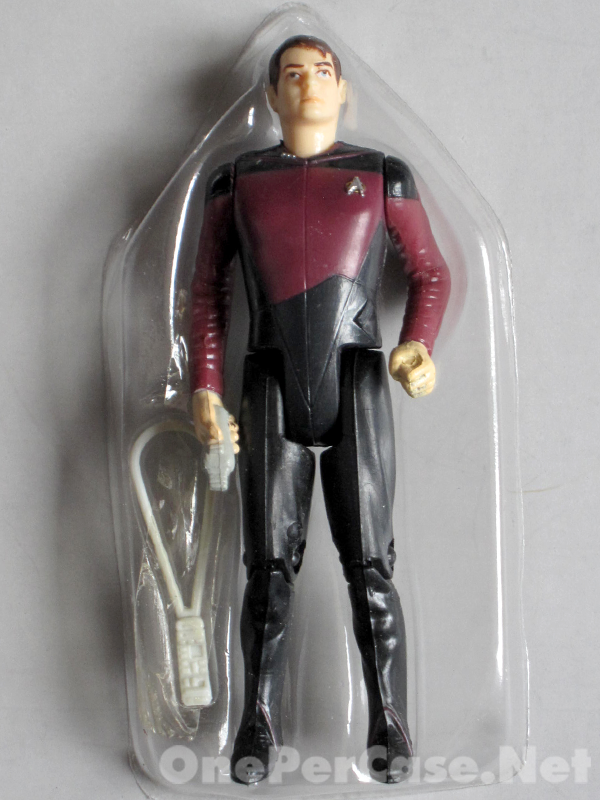 Once you know this is supposed to be Jonathan Frakes, you can fumble your way through an “oh yea, I can sort of see that resemblance” excuse on the head sculpt, but you’re gonna feel like Brett Farve doing it. The one actual accessory is a tricorder. Ugh. 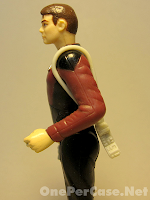 It’s got a big clunky strap that allows it to dangle over Riker’s shoulder, and luckily it does a decent job of that. 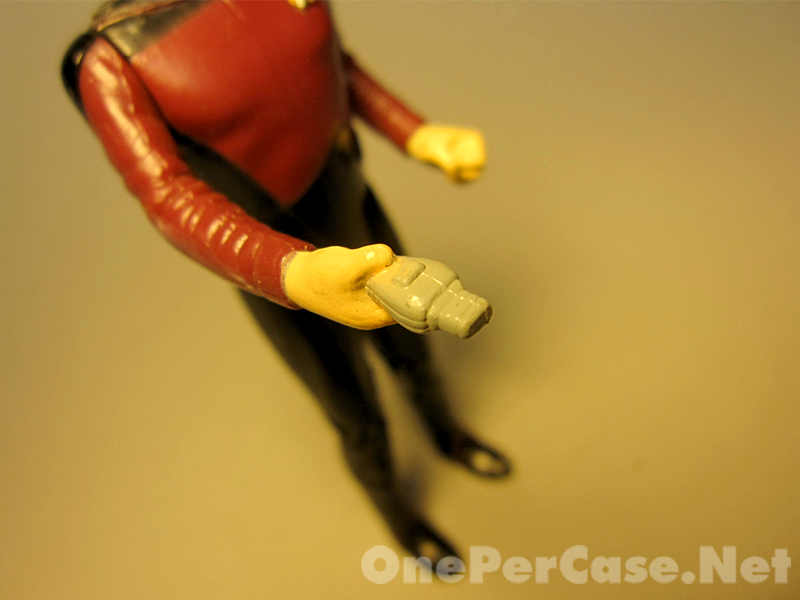 Since his left hand has a phaser permanently sculpted into it and his right hand is a fist, there’s no chance of your Riker ever using his tricorder. Not to mention, his flap’s open, and that is going to be a major drain on the battery. Yes, that is a phaser permanently sculpted to his hand. This basically ruins what was a great shot at an accessory. Then again, given the tricorder, maybe it’s best that Galoob stars away from more accessories. 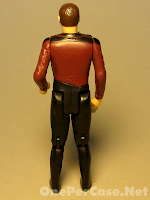 The uniform is probably the highlight of the sculpt. It’s pretty much screen accurate, and the boot cut at the bottom of the pants is highlighted nicely by a touch of paint. 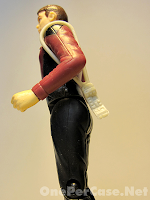 He’s far from super-articulated, but Riker manages to stay one small step above stiffness. You can move his head, shoulders, hips and knees. I’m assuming the knee movement was included for the unproduced Enterprise ship and playsets that never saw the light of day. 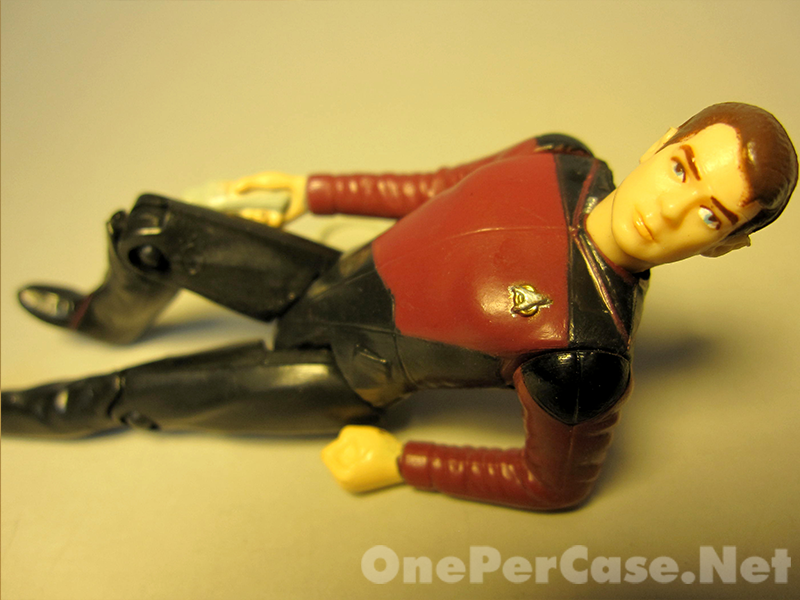 All it really helps for is a leisurely Riker pose. 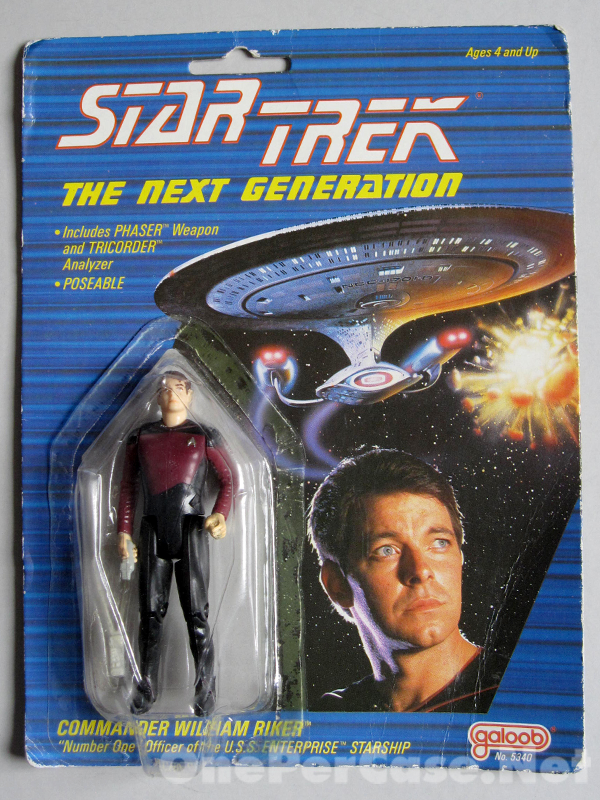 Bottom line, if you find yourself in possession of any of the Galoob Star Trek: the Next Generation figures, I strongly urge you to become a carded collector. He looks nice on the card, but once you open it up Riker’s flaws are quickly exposed in all their embarrassing glory. 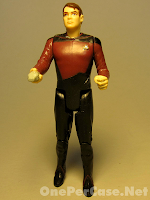 yeah based on today's standards galoob's star trek figures fall short but for it's time they were pretty decent. 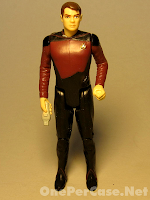 the riker likeness is pretty good, at least for me. 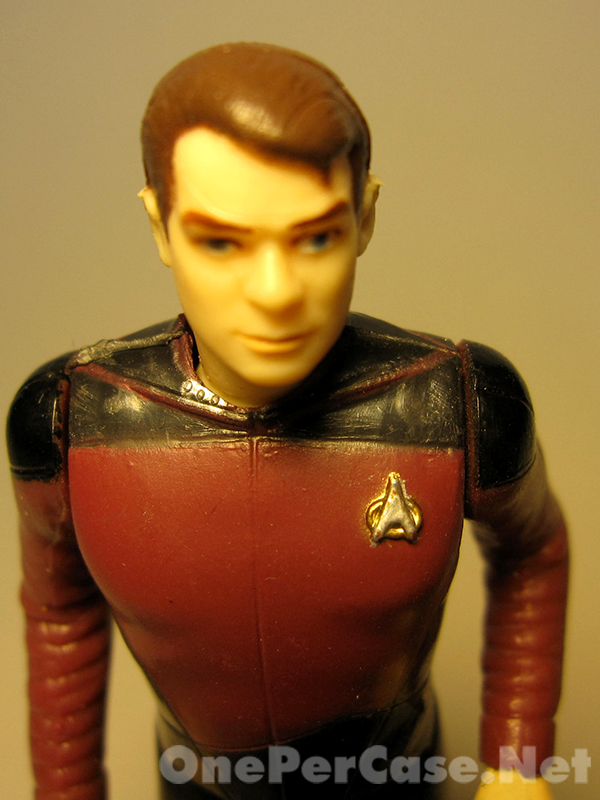 the galoob picard headsculpt is pretty amazing even by today's standards. 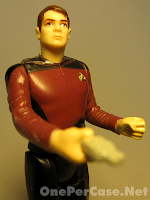 these figures came out only 2 years after the last of the vintage star wars figures were released and the sculpting on the trek figures blows them away away. More articulation than the current Iron Man 3. You are definitely right about the Picard sculpt. Honestly, most of the sculpts are pretty decent. 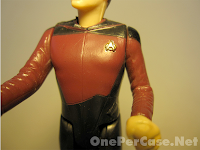 I think the Riker is actually the weakest. 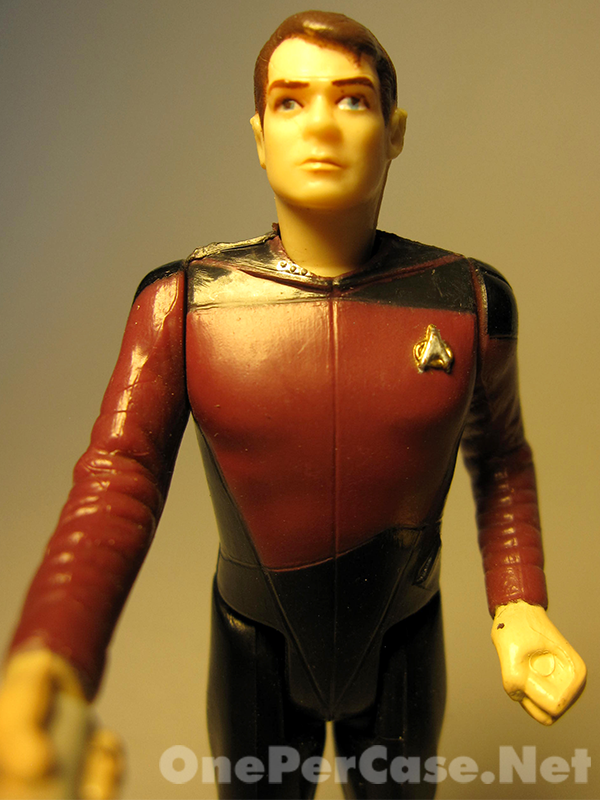 Picard is nice, the Worf, Geordi, Yar, etc. are all good, especially considering these are well over 20 years old. 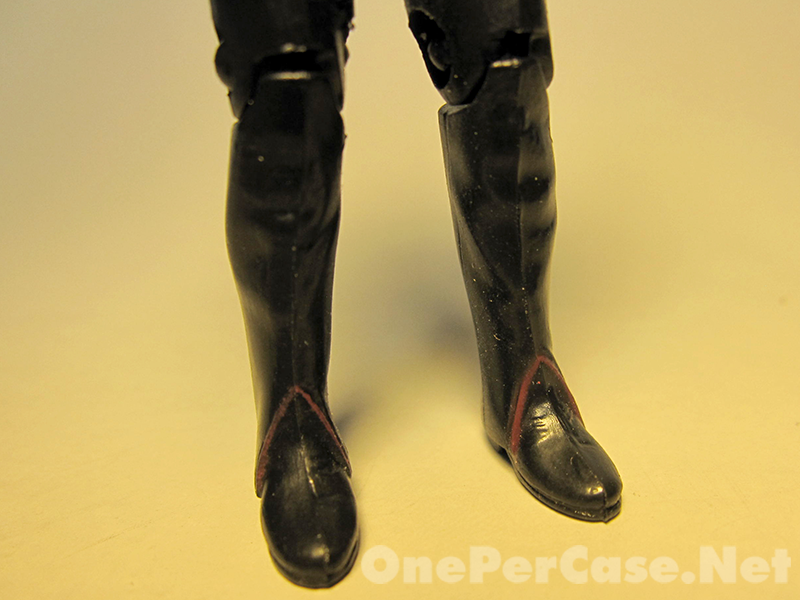 As far as articulation, yea, sadly the current Hasbro trend seems to be less articulation. Those new Spider-Man figures weren't too spectacular either, and the images I've seen of the upcoming Wolverine figures look like they're headed the Happy Meal route, too.